Embry-Riddle Aeronautical University is the world's oldest, largest, and most prestigious university specializing in aviation and aerospace. Our Worldwide Campus offers many Associate, Bachelor, and Master’s degrees, as well as, certificate programs to support your educational and career goals. These are supported worldwide by hundreds of web based resident and online classes, attended by students at all hours of the day and night. Our friendly staff at the ERAU Beale office is here to assist in developing an education plan, tailored to support your career goals and personal schedule. We have five nine-week terms that meet at the Beale AFB Education Center, once a week, beginning each January, March, May, August, and October. We also have nine-week online classes starting every month. 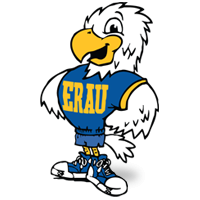 For more information, please call Mike or Kevin at (530)788-0900/9545, or visit our websites at: www.erau.edu, ERAU-CA, or ERAU-Beale. Get your Embry - Riddle Aeronautical University, Worldwide gear! Embry-Riddle Aeronautical University’s Worldwide Campus has once again secured the top spot in U.S. News & World Report’s 2018 Best Online Bachelor’s Programs for Veterans. Since 2014, Embry-Riddle Worldwide has ranked in the top five of the annual list, including being named No. 1 for the past three years. In the most current rankings, it tops the list in a tie with Temple University with Arizona State University, Utah State University and Oregon State University rounding out the top five. Headquartered in Daytona Beach, Fla., Embry-Riddle Worldwide provides bachelor’s, master’s and doctoral degree programs for more than 23,000 students online and at 125 campuses in the United States and globally. Nearly half of those undergraduate and graduate students are active military, in the reserves or veterans taking classes online or onsite at military bases around the United States or abroad. To publish its annual list specifically addressing veterans, U.S. News & World Report analyzed 97 universities in the nation in the following categories: Student engagement, faculty credentials and training, peer reputation, and student services and technology. For the complete U.S. News & World Report 2018 list of best online bachelor’s programs for veterans, go to usnews.com/education/online-education/bachelors/veteran-rankings.